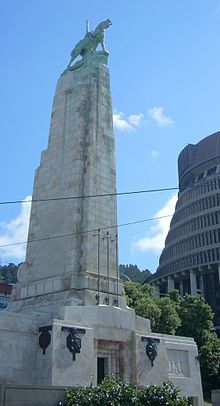 I have just returned from the ANZAC Day Dawn Service at the Wellington Cenotaph with good friends from the NZ Defence Force. It was a touching ceremony, lasting about a half an hour, starting about 5:45am. The time, in and of itself, is striking…the American equivalent for veteran remembrance is, of course, Veteran’s (and/or Memorial) Day. Veteran’s Day celebrates the armistice reached for World War I, famously at the 11th hour (11:00am) on the 11th day of the 11th month (November 11th). ANZAC Day is a day of remembrance of those that gave their lives in the unsuccessful landings at Gallipoli. I thought I would write about the key reflections I have of the ceremony. Essentially, these are snap judgments, differences that stick out to an American military officer about how Kiwi’s honor war’s casualties. One must remember that the sample size is small and recognize that full conclusions are not possible in observing one event. 1. Choice of date. Veteran’s Day celebrates final victory in a great conflict (not that that stopped the second world war from happening) whereas ANZAC Day is a day of remembrance of those that died tragically in a terrible military campaign failure. The tones are different, and noticeable. 2. Christianity in the program. There was a heavy dose of Christian-specific prayer and hymns sung during the service. For the most, US services are as non-denominational as possible, referring to “the Great Creator,” etc. This was interesting as local news coverage over the Easter holiday has focused on the reduced role that faith and religion seems to be playing in NZ (evident with an atheist PM; one could hardly imagine an atheist American President). Image of a “Letter to the Editor,” Dominion Post (Wellington, New Zealand), April 28, 2011, page B4. 3. Specific reference to Kiwi peacekeeping missions. The individual who led the service referred specifically to those of the “New Zealand Defence Force acting as peacekeepers in 19 countries worldwide.” This was the lone mention made of the NZDF’s current role/contributions in the world. This gels with the sentiment that seems to exist in the general public that NZ only does peacekeeping missions. American Veteran’s Day celebrations may mention this (the concept that war is always fought for “a better peace”), but would not likely focus on the point. 4. Anthems: Australia’s National Anthem is “Advance Australia Fair” while New Zealand’s is sung in both Maori and English and called “God Defend New Zealand.” I think it’s interesting in terms of tone to consider that Australia’s anthem title evokes an image of a forward leaning country, maybe even aggressive. New Zealand’s, on the other hand, seems more restrained and reliant on the good graces of a higher power to protect and defend Aotearoa (Maori term for “New Zealand” – “Land of the Long White Cloud”). Interesting contrast (and certainly I’m not the only one who has thought to compare the two). 5. Inscription inside the Cenotaph. I waited around until the crowd diminished enough to get inside the Cenotaph. Inside, one can find a beautiful book with all the names of those Wellingtonians that passed in the two great wars of the last century. Additionally, there is a bronze plague dedicated to those that died in both wars. Pretty typical stuff. But, towards the bottom of the plague there is a specific statement acknowledging all the sacrifices and contributions of those civilians that served the NZ government during the wars. I found that interesting, considering that there has been some recent press about Kiwi coastwatchers in the Pacific. Essentially, there were NZ civilians that served as “coastwatchers” in the Pacific to assist the Allied cause. 17 Kiwis were beheaded by the Japanese on Tarawa in October 1942, the remains found in 2010. Similarly, Australia found 20 of their coastwatchers befell a similar fate, and provided a posthumous gallantry ceremony in 2011 to honor the sacrifice these young men paid for their country. NZ’s Defence Minister, Dr. Wayne Mapp, is quoted in the story as taking a wait and see/drag the feet approach towards the problem (even in the face of a 91 year old POW survivor agitating for some recognition). It’s hard to turn a blind eye to the inconsistency, especially when one calculates how little effort it would take on the part of the government to recognize these men. MAJ Matt Cavanaugh is a US Army Strategist, a Non Resident Fellow with the Modern War Institute at West Point, and has served in assignments from Iraq to the Pentagon, and Norway to New Zealand. A Contributor at War on the Rocks, he looks forward to connecting via Twitter @MLCavanaugh. This essay is an unofficial expression of opinion; the views expressed are those of the author and not necessarily those of West Point, the Department of the Army, the Department of Defense, or any agency of the US government. NextA Song of Ice and Fire…and Walls?